The growth in the number of international students coming to study in the United States hasn't just slowed in higher education. The current administration's efforts to more tightly control visa issuance has also slowed growth in the count of students from outside the country attending high school. Between 2004 and 2016, the number more than tripled to almost 82,000. However, according to a new report by the Institute of International Education (IIE), "the rate of growth has gotten smaller more recently." 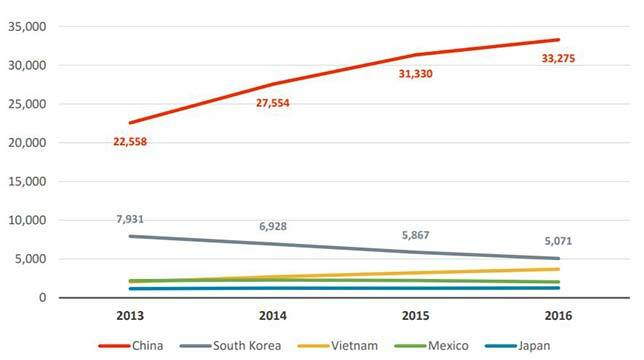 IIE's "Globally Mobile Youth: Trends in International Secondary Students in the United States, 2013-2016," reported that "diploma-seeking" international students dominate visa acquisition at the secondary level. In 2016 72 percent of those students had F-1 visas, signifying that they intended to earn a U.S. high school diploma, while the remainder had J-1 visas, designating their status as exchange students in shorter-term programs. According to the report, most of the international students attending high school in this country ultimately expect to enroll in higher education here as well and view their U.S. studies as a leg up on gaining acceptance to the colleges and universities they want to attend. The thinking among families of international students is that the experiences they have of learning in U.S. classrooms, the immersion they receive in English-language instruction and the adjustment they get to American life prior to college "can ease the transition of international students moving from U.S. high schools to higher education." The largest group of students holding F-1 visas — 78 percent — come from one area of the globe: East Asia. In particular, students from China dominate, making up 58 percent of all international high school students, followed by a smaller number coming from South Korea (7 percent). The clear majority (94 percent) attend private schools, predominantly religious schools. In the case of public schools, some establish international exchange programs "to provide cross-cultural learning for their U.S. students." Others — especially small or rural ones — build international programs "as a way to boost enrollment." The report noted that the number of U.S. schools enrolling international students grew 26 percent, to 2,800 in 2016 from 2,300 in 2013. According to researcher Christine Farrugia, the increase in schools accepting international students outpaced the 12 percent growth in student numbers, "suggesting that there may be greater competition for students among high schools hosting international students." Some high schools, Farrugia wrote, are working in collaboration with local colleges and universities "to create formalized pathways or dual enrollment programs for international students," to help them transition to college. Other institutions of higher education have set up "international high schools" on their campuses to help with recruitment of international students. The top states for hosting international students are California (with a total of 12,201 students in fall 2016), New York (with 6,145) and Texas (with 4,717). These are the same three states that lead in college-level international student enrollment. Even as the visa landscape is "shifting" for international students in the United States, their presence here still offers potential for K–post-secondary, Farrugia asserted. At the K-12 level, she noted, these individuals "enrich the classroom experience for their U.S. peers and the wider community as well, since many live with host families." At the college level, they represent a domestic recruitment opportunity for undergraduate admissions. Likewise, added Rajika Bhandari, head of Research, Policy and Practice at IIE, in a prepared statement, "Learning to work with international colleagues will be valuable experience for both the international students and the American students in in their future careers, and will help develop talent that is needed by employers in the United States and in the students' home countries." The report was funded by a grant from the U.S. Department of State's Bureau of Educational and Cultural Affairs. The full report is available on the IIE website here.